Your equipment deserves the strongest possible support service. Colonial Medical performs field service work on all shapes and sizes of anesthesia systems. We strive to give you the confidence knowing that your machine is performing at it's best. Our team of experienced field technicians and knowledgeable office staff are ready to meet all your service and repair needs. All anesthesia equipment and accessories should be periodically checked, certified, calibrated, repaired and/or replaced. We work with each of our customers individually to determine the best timeline for scheduled maintenance in order to avoid unwanted interruptions. Our database reminder allows us to contact you a month before service is due to plan for a day and time that fits into your busy schedule. We are also available for last minute repairs that may pop up or will be there when an emergency visit is needed. Below will detail and explain a variety of service options that we offer. 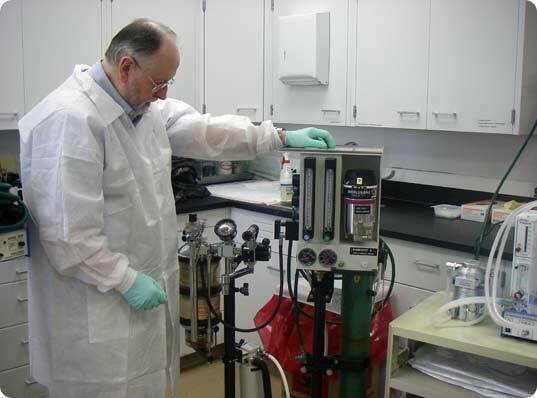 Our experienced technicians come to your lab to perform complete preventative maintenance. This includes an overall check of connections, parts and system set up starting at the oxygen source all the way through to your waste gas collection method. Equipment is leak tested and vaporizer output certification is obtained by a digital Riken analysis. Rubber goods are replaced as needed, suggestions for safety or function offered and all information recorded on a service report that will be submitted electronically to the person who scheduled the visit. Understanding the difference between vaporizer certification and vaporizer calibration is important. Another point to make is that your machine and vaporizer are two separate components that work together as one. Annual on-site service is recommended in order to verify both vaporizer and machine are working properly. Certification testing ensures that your vaporizer is performing according to its manufacturers specifications. This test is performed on-site at your location by our personnel. However, if your vaporizer fails on-site testing, this would be cause for action for one of two reasons. One the unit failed its leak test. The other, the unit failed its integrity test. In either case, other than purchasing a new vaporizer... read on about the two options you have to bring your unit back to proper specifications. Option 1: Vaporizer cleaning and calibration is needed when your vaporizer fails during on-site visit. For this procedure, your vaporizer would be shipped to our factory service center and your same unit will be returned to you. Option 2: Vaporizer Exchange Program will replace your unit with another. You will be shipped a comparable vaporizer that is ready for use and has a year warranty on its calibration. You will place your failed unit in the designed packaging that is provided to you along with prepaid shipping label to ensure safe travel of the failed unit back to us. The replacement is yours to keep and you will not receive your failed unit back. Calibration is when a vaporizer is completely disassembled and all internal components are cleaned and inspected. All consumable parts are replaced and the unit is then reassembled, tests are performed and calibration method is completed. This is not a field service. Our factory service center also offers conversion options that include converting most types of vaporizer from one agent to another or from one fill style to another. Your vaporizer would be shipped in for work requested and your same unit will be returned to you. To request an on-site service visit, please complete the following form and our representative will contact you to schedule an appointment.